Archos Diamond Omega has been officially launched in Europe. The smartphone features some great specs starting from its screen display which is also bezel-less, build, storage, RAM, camera, battery and other interesting features. The device will only be available in Europe and will be priced at 500 EUR. 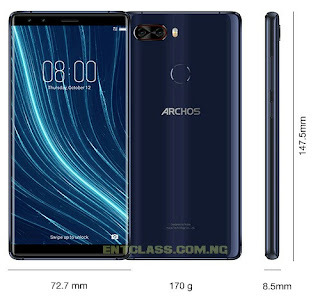 Here's the full specifications of Archos Diamond Omega phone. Wow the phone is superb, what will make me go for this device is the phone coming up with 128gb, 8gb ram. But the battery capacity seems manageable. Just waiting for the price in nigeria to see if i can afford it. Good phone, nice specs but the battery capacity should be 4000mah. Nice device, Good RAM, the phone is expensive. This phone is nice and the specs are up to date and the amazing feature of it is the phone coming up with 128gb.i wish i can afford it. The phone is too expensive and has low battery but has good specifications. The device has good RAM, I believe it is going to work efficiently but its battery is supposed to be around 5000mah.